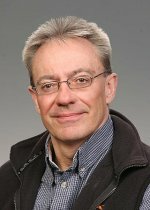 Ian Gorton, Fundamental & Computational Science Directorate, has been elected a Senior Member of the IEEE Computer Society, the world's leading professional association for the advancement of computer technology. With nearly 85,000 members, the IEEE Computer Society is the world's leading organization of computing professionals. Founded in 1946, and the largest of the 39 societies of the Institute of Electrical and Electronics Engineers (IEEE), the Computer Society is dedicated to advancing the theory and application of computer and information-processing technology. Members rely on IEEE as a source of technical and professional information, resources and services. Ian, Associate Division Director in the Computational Science and Math Division, was inducted as an IEEE Senior Member in June. The program includes members with at least 10 years of professional experience who have demonstrated performance that sets them apart from their peers through technical leadership and technical or professional contributions. IEEE Senior Member status recognizes the top 12 percent of IEEE's Professional Members for their demonstrated excellence in their respective field. IEEE's Senior Members join a distinguished list of colleagues to whom IEEE and its members look for guidance and leadership in computing and information technology.